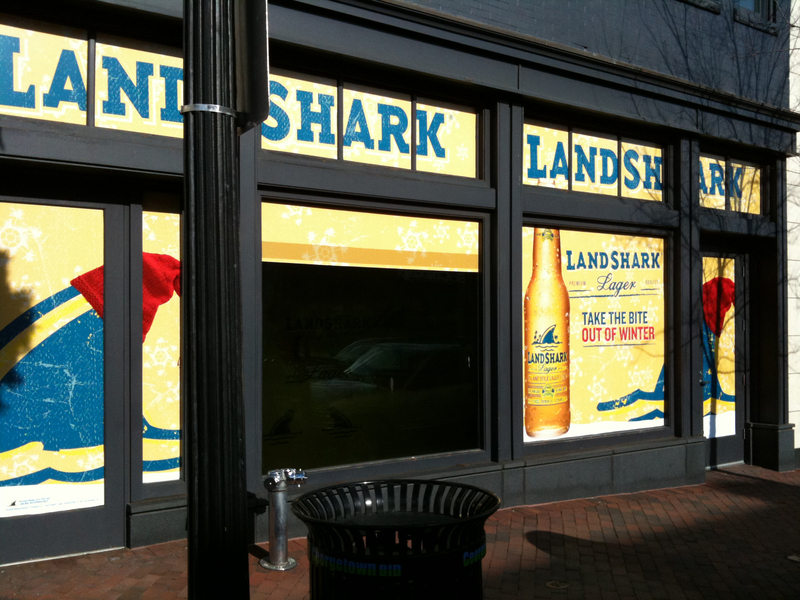 The other day GM wrote about the billboard at 3345 M St. advertising Landshark Lager beer. It was put up on the windows of a vacant building owned by EastBanc. GM asserted that it probably violates the Old Georgetown Act if not other relevant rules and regulations. Turns out it’s “other relevant rules and regulations” not the Old Georgetown Act that apply. GM got in contact with the Fine Arts Commission, which oversees the Old Georgetown Board. The approach they are taking is that if a sign does not stay up for 60 days, it is not subject to the Old Georgetown Act. So GM was wrong to assert that this is a clear violation of the Old Georgetown Act. However, since the sign appears in the Georgetown Historic District, it is subject to the jurisdiction of the Historic Preservation Office in the District Office of Planning. Upon being notified of the sign by the ANC (which happened last week) the enforcement office of the HPO notified EastBanc that even a temporary sign like this requires HPO approval. Since that approval was not sought EastBanc has until next Monday to remove the sign or face a $2,000 penalty. Rigorous enforcement of this rule is important, in GM’s opinion, since it will prevent the rest of the empty storefronts from turning over their windows to whoever is willing to pay. Maybe it is a reasonable request for landlords to offset the loss of rental income by erecting temporary advertising, but that should not be done without proper oversight. GM admits that aesthetically speaking this ad is not that bad. But without proper oversight, there’s nothing stopping them from putting up a temporary ad for Saw VII or, god forbid, Jimmy Buffett’s next album. Hopefully the swift action by the HPO office will mean that billboards like this won’t be the wave of the near future. If EastBanc or other owners of vacant properties want to “monetize” their windows, they ought to push the issue through the proper channels. Come on… We know you’re a parrothead. Saw it in its full glory on the way home last night, and it looked like it was in turned-off-morning-mode this morning.